news Communications Minister Malcolm Turnbull has reportedly promised to attempt to intervene in the Government’s Mobile Black Spot Programme to accelerate the deployment of a mobile tower in Dwellingup in Western Australia, in what appears to be an effort to boost the Liberal Party’s chances in the Canning by-election in the state. The seat of Canning has been held since 2001 by long-standing Liberal MP Don Randall. However, Randall unfortunately passed away in an untimely manner in mid-July, leaving the seat open. A by-election has been called for 19 September. 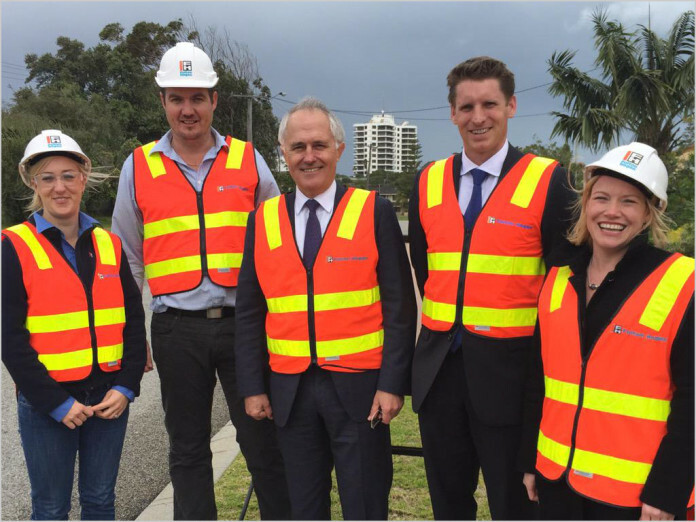 Last week, Minister Turnbull made a campaigning trip to Canning associated with the by-election campaign. According to the Mandurah Mail (we recommend you click here for the full article), at a public forum at the Pinjarra Bowling Club last week, the Minister made several comments about mobile access in the region. Turnbull, according to the newspaper, noted that the Government was currently supporting the construction of a new mobile phone tower in the region of Dwellingup. “Dwellingup is the black spot that’s currently been approved and I’ll be talking to my department and Telstra to see if we can bring it forward,” he said. The tower being constructed in Dwellingup is part of the Government’s Mobile Black Spot Programme, the result of a 2013 Federal Election pledge by the Coalition to spend $100 million supporting mobile telcos such as Telstra, Optus and Vodafone to fix mobile blackspots around the country. It appears that both Randall and WA State Member for the Murray-Wellington electorate, Murray Cowper, both pitched to have the Dwellingup tower built. However, the selection of the locations for the blackspots was not made on an arbitrary basis, and it does not appear that the locations were initially selected by the Government with relation to election outcomes. The Government published a set of six guidelines (PDF) for determining where it would support new or upgraded mobile towers. These include mobile coverage outcomes, whether they were nominated by a MP (from any party), co-contributions by telcos, the cost to the Government, the services offered, the ability to provide roaming services, and whether more than one mobile network operator would provide services from the base station. It is not clear whether Minister Turnbull’s pledge to try and expedite the mobile tower build in Dwellingup to directly support the Canning by-election would breach these guidelines. Turnbull also reportedly stated that the Coalition had “dealt with 490 blackspots” so far under the program, but it is not clear that this is an accurate statement. The locations to benefit under the first round of the Mobile Black Spot Programme were only announced on 25 June 2015 — meaning that construction in many areas has not been finalised yet. What we appear to be seeing here is an open politicisation of the Mobile Black Spot Programme. It’s true that this program was set up by the Coalition Government as part of an election pledge during the 2013 Federal Election campaign — so you could say that it was politicised from the start. However, the Government did publish independent guidelines for the selection of mobile towers under the program, and those guidelines did not have anything to do with election outcomes, aside from the fact that any MP — Labor, Coalition or crossbench — could make a pitch for a tower to be built in their region. Minister Turnbull’s pledge to try to “bring forward” the Dwellingup tower would appear to be a direct political intervention in that process, to try and serve Liberal needs during the Canning by-election. The reality is that this is politics, and few in Australia’s political sector will complain about this behaviour. In addition, I don’t really think speeding up the Dwellingup tower would divert significant resources from other areas. As with the situation where the Minister involved NBN contractor Fulton Hogan in the by-election, in the big picture Turnbull’s comments on mobile blackspots are not a huge deal. But I personally don’t like what has happened here — I think it shows a direct example where a Minister of the Crown is using their personal power to serve the needs of their own party rather than respecting independent processes designed to serve Australia as a whole. The needs of one by-election should not trump the needs of the nation. This hasn’t and won’t stop successive governments using NBN as a political football. I’d be genuinely surprised if either side hadn’t tried to use it as an election sweetener. It stinks … and it wouldn’t surprise me if T$ will happily acquiesce to MT’s ‘inquiry’ and a tower magically appears in short order. The amount of pork in the NBN deal and subsequent maintenance contract of the CAN you’d reckon there’s more than a few favour’s worth there. Labor had made most of its incumbency advantage in 2010 election using NBN launches in marginal seats. So I have no problem for Turnbull to expedit the mobile tower building in Canning for the by election. Of the 60 NBN sites, 36 are in Labor-held seats, 21 are in Coalition seats, two are in seats held by independents and one is in the seat of Melbourne, held by the Greens’ Adam Bandt. Yep, your right, 36 “labor” seats vs 24 “other” seats. The fact that the early roll out was concentrated in Tasmania because “Tasmania has sites in every electorate because its land mass was smaller, which made it easier to cover more ground” would have nothing to do with it, right? Of course, Tassie is now a LNP state, so….what exactly? The rollouts serviced Labor and Liberal seats fairly equally. The NBN CEO declared there was no no electoral consideration to rollouts. There ws no pork barelling. But can Turnbull claim the same? Always meddling. I live in Clive’s electorate and have zero fixed line services to choose from, and really sketchy mobile. I can only hope for some pork barreling love with either NBN or new towers over the next 12 months. Funny thing is we were supposed to have NBN fibre rolled out here right about now, well, at least up until the big cancellation of 2013. Funny thing is we were supposed to have NBN fibre rolled out here right about now, well, at least up until the big cancellation of 2013. That’s kinda the crux of the whole thing, isn’t it. The most progressive member of the current government is the one that’s doing the most to hold the country back. That’s the wonder that’s Tony Abbott I guess..
he can pork barrel as much as he wants. The privileged idiot still fails to realise mobile access is a massive expensive scam and a joke. I would be highly surprised if it were possible to fast track this site as I suspect from previous experience that the Commonwealth, WA State Government and Telstra are still going through the process of executing funding agreements for the entire program and it would be impossible to unpick one site out of this and expedite it. I suspect that not a single new site has had development approval or land tenure resolved as this would only commence once the funding agreements had been resolved. I would suggest that Minister Turnbull pick up the phone to his WA State counterpart and have a chat. he has conveniently accepted the State’s contribution to pad out his program but neglected to remember they get a say in the implementation process. A bit like the NBN. One day Commonwealth people will realise that it is difficult to implement their ideas and programs without the solid help of the States and Territories where deployment takes place. Don’t youse just love good old adversarial politics? But let’s face it, if Joh had been running this, Dwellingup would have got at least 3 towers and FTTP with a Coalition win… I wonder what the World’s Best Treasurer would have come up with?